‘History is knocking at our door,” declared Alexis Tsipras, the leader of the leftwing coalition party of Syriza in Greece, during a speech addressed to thousands of supporters in Athens on Thursday night as he stood next to his foreign compatriot Pablo Iglesias of the Spanish Podemos Party. 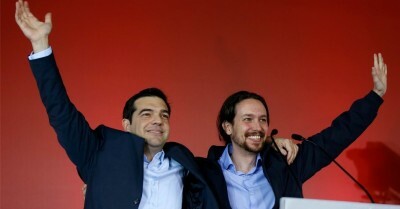 Syriza and Podemos have become the mouthpiece of the anti-austerity movement in southern Europe while Tsipras and Iglesias have emerged as key political leaders who emerged from the grassroots, street-level protest movements which rose in opposition to the severe economic policies imposted by elite forces following the financial crisis that began in 2008. In relatively short time, both Syriza and Podemos went from being non-existent political entities to standing on the doorstep of taking power. According to reporting by the Irish Times, Tsipras “received one of his biggest cheers of the night when he said that he will press for the repayment of a forced war loan from Greece toGermany during the second World War. Taking the podium to address the thousands gathered, Iglesias indicated the fate of the Greek and Spanish people—both crushed by unemployment and the gutting of the public sector—were intimately tied. But, Iglesias declared, “The wind of democratic change is blowing in Europe.” Less than one year since its inception, Podemos is now polling ahead of Spain’s ruling party. Though national elections in Spain could happen later this year, they have not yet been scheduled. A sampling of voices taken from the crowd in Athens reveal that those supporting what Podemos and Syriza represent are ecstatic for the hope the parties are now offering. Ahead of the Greek election on Sunday, the latest polling in the country shows Syriza has built on its previous lead over the ruling New Democracy party, now led by Prime Minister Antonis Samaras. Analysts maintain that Syriza’s ability to attain an outright majority will be difficult. With pressure mounting from the EU and IMF to “respect” the commitments made as the price of aid, speculation has been rife that the party might prefer to enter a coalition government that would enable it to forge ahead with the structural reforms and budget cuts demanded in exchange for the biggest financial assistance programme in global history. But Tsipras put paid to that. The leftists, who have never held office in the near 200 years of the Modern Greek state – and who, after a bloody civil war, were hounded and imprisoned for decades – wanted to win an absolute majority that would allow them to govern unimpeded, he insisted. Dr Eleni Panagiotarea, a research fellow at Greece’s leading thinktank Eliamep, said Syriza was on a roll. Though Prime Minister Samaras has tried to counter the rise of Syriza by telling Greek voters that its leftwing policies will lead the nation to ruin, experts and economists argue that it has been the austerity policies imposed across Europe, though most severely imposed in nations like Greece and Spain, that have been the clearest culprits of economic ruin. Greece continues to face a dismal future under the current European program, with more than 18 percent unemployment even in 2017. This is according to IMF projections, which have been consistently over-optimistic in the past. Mass unemployment will also be the norm for the eurozone, with more than 10 percent unemployment in 2017, even if it the eurozone authorities’ program is “successful.” Not to mention all the other sacrifices in living standards, including cuts in health care spending, public pensions, minimum wages and government services. This prolonged punishment and regressive social engineering from the European authorities is only possible because the electorate has had little or no influence over the most important economic policy-making. The Greeks are trying to win some of that back; hence the intimidation from on high. And Nobel Prize-winning economist Joseph Stiglitz, in a recent column, called the commitment to austerity by European elites—namely the IMF, the ECB, the European Commission, and the powerful German government—a very cruel form of “economic madness” that betrays sound reasoning.